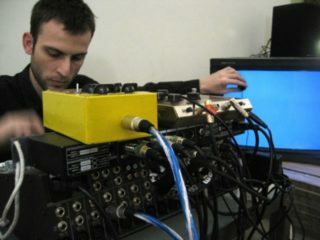 Valerio Tricoli (1977) is one of the most important figures of the modern musique concrète, a composer, performer, sound installation artist, improviser, and maestro reel-to-reel tape recorder instrumentalist. His works relate to reality and virtuality of sound, the various forms of sound reproduction, and the problem of memory with regards to the mentioned subjects. According to Tricoli, musique concrète is forever suspended between “here and now” and the shady domain of memory – distant, but at the same time present, similar to a deja-vu experience. Tricoli is also one of the key people behind the prominent experimental music record label PAN. He collaborated with artists such as Jerome Noetinger, Robert Piotrowicz, Antoine Chessex and Werner Dafeldecker. His pieces were played on the stage of the legendary Transmediale in Berlin as well as many other festivals all over the world. The aim of Valerio Tricoli’s residency is to prepare a chamber opera based on the diaries of Pierre Schaeffer, the creator of musique concrète and one of the most imporant figures for the music of the 20th century. Schaeffer’s work is usually perceived in the context of recording and composition of recorded material – he is the first person to systematically map out the possibilities available to composers in recording studio. His diaries, however, reveal that his ambitions were fuelled by a different motivation. Schaeffer really wanted to create a total instrument, one which would enable live performances of music that sounds like everyday life. Because the possibilities were limited in the 40s, Schaeffer utilized recordings to solve the problem. Today we have the means to fulfill his ambitions. Valerio Tricoli intents to create a chamber opera that brings back Schaeffer’s original ideas and tells a story of its realization. For this purpose Tricoli, an expert on modern musique concrète, together with Daniel Muzyczuk and curator Michał Libera, will prepare a libretto based on Schaeffer’s diaries, record it on tape and prepare a musical performance with the use of recordings. The residency’s final result will be the composition of an open piece for a libretto based on Pierre Schaeffer’s diaries – for live performances. Concert takes place as part of the A-I-R Sanatorium of Sound Sokołowsko implemented in cooperation with the Artist-in-Residence Programme A-i-R Wro. The A-i-R Wro Programme is a part of the European Capital of Culture Wrocław 2016 and is subsidized by the Ministry of Culture and National Heritage of Poland.